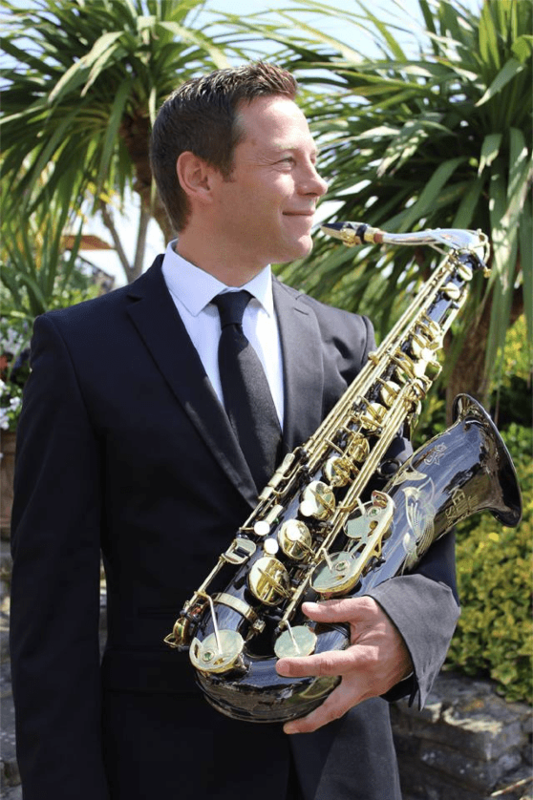 I am a saxophonist and saxophone teacher in Bournemouth with many years of playing experience across Dorset, Hampshire and beyond. I provide private affordable saxophone lessons and tuition in Bournemouth, Poole and surrounding areas on a one-to-one basis so that together you can improve your saxophone playing and become more confident in your abilities. If you’re looking for a Bournemouth saxophone teacher, I offer a wide variety of subjects to improve your saxophone skills. Available to teach to all ages, and am fully DBS/CRB checked. Beginners very welcome, so if you are feeling nervous or unsure about playing the saxophone, now is the time to learn! A bespoke lesson plan will be designed around you, the individual. Fully insured for public liability with the Musicians Union (MU). As well as teaching I perform everything from solo saxophone with backing tracks (perfect for your special occasion), a small jazz combo (trio/quartet), saxophone quartet and larger bands. Some of my notable performances include the Bournemouth “OnStage at Pier Approach” annual summer event, Taverners Big Band, Bournemouth’s Shelley Theatre, Chichester Jazz Club, and the Chichester Observer Business Awards. I gig regularly with various bands, including the awesome Red Fez Orchestra, Forza Saxophone Quartet, and the West Sussex based jazz trio Tom Belbin Trio. I’m currently a Masters student in Music Performance at Southampton University. I co-run JazzSmart music workshops, which in collaboration of some of the UK’s most respected educators and saxophonists such as Derek Nash and Andy Scott, help people realise their dream of becoming better musicians. Our saxophone workshops run regularly through the year, with emphasis on improving ensemble playing, sight-reading, tone, technique, and dedicated courses for jazz improvisation. I also co-run the Chichester Jazz School which focuses on providing day workshops to local people in the area wanting to improve their jazz and improvisation knowledge. I am available for one-to-one saxophone lessons in Bournemouth and the surrounding areas. My saxophone lessons will cover subjects such as tone, rhythm, reading music, technique, articulation, music theory, and much more. Find out more about my Bournemouth saxophone lessons and how I can help you get more from your music. I’m also available for weddings, corporate events, and anything in between too – I can provide beautiful music as a traditional jazz quartet, saxophone quartet or a larger big band feel. Feel free to contact me for an informal chat about your event requirements.